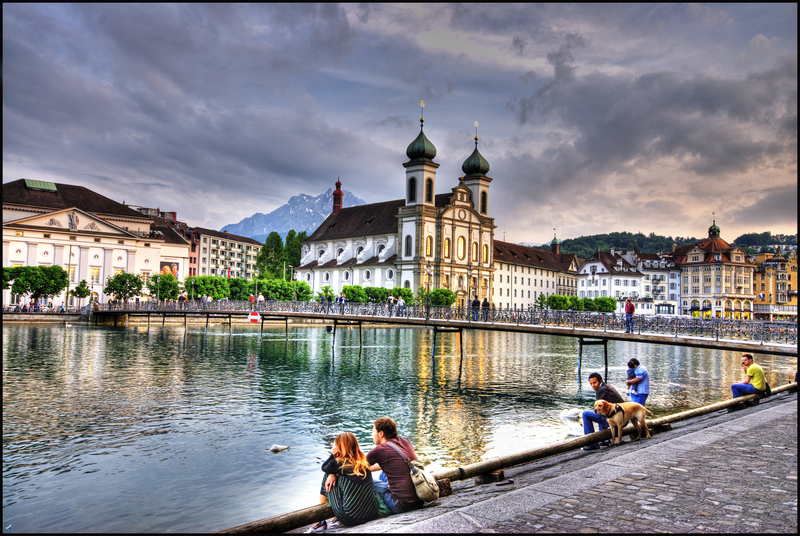 Lucerne, also written as ‘Luzern’, is a city in central Switzerland, home to over 76,200 people. It’s location on the shores of Lake Lucerne , and at the foot of Mount Pilatus, means it is one of the most popular cities for tourists. 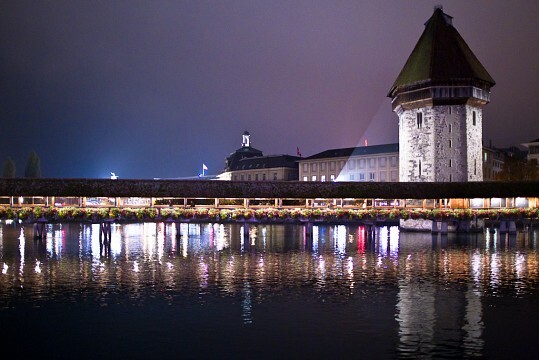 As early as 1178, Luzern gained independence, and quickly became an important trade route. The Hapsburgs controlled most of the area until 1386, when Austrian rule ended. Luzern was one of the first cantons of the Swiss Confederacy, when it joined together with Uri, Schwyz, and Unterwalden in 1332. Agriculture stayed prominent in the region until the later 19th century, even when industrialization hit neighboring cities hard. Most recently, in 2007, Lucerne merged with Littau to create a joined city, in an effort to create a large, more unified city. 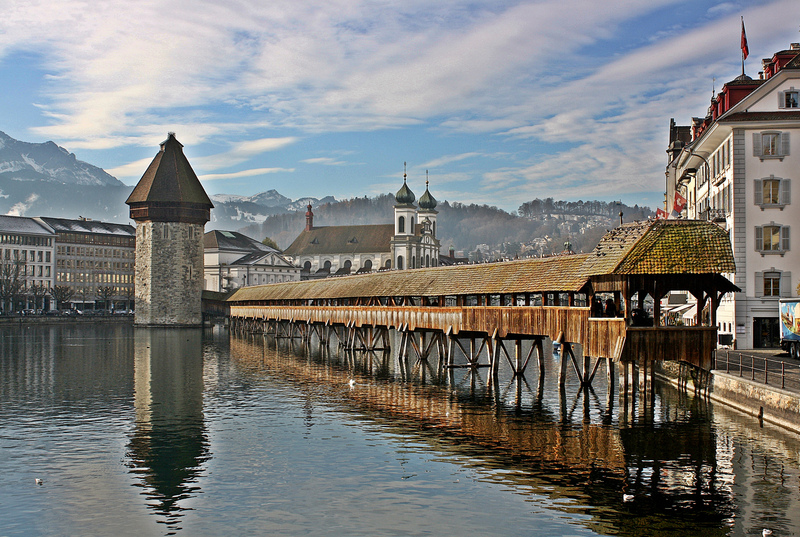 The Chapel Bridge, located in central Luzern, is said to be the oldest wooden bridge in Europe, and spans the Reuss River. Constructed in the first half of the 14th century, to be part of the city’s fortifications, the bridge was named after St. Peter’s Chapel. The bridge is a footbridge only, constructed entirely of wood. It partially burned down in 1993, and was rebuilt a couple of months later, in the same fashion. At the end of the bridge is a water tower, which also served as a dungeon for some time. It is still in operation now, as a club room for a local organization. All along the bridge there are wooden panels featuring old paintings representing different motives and ideas. 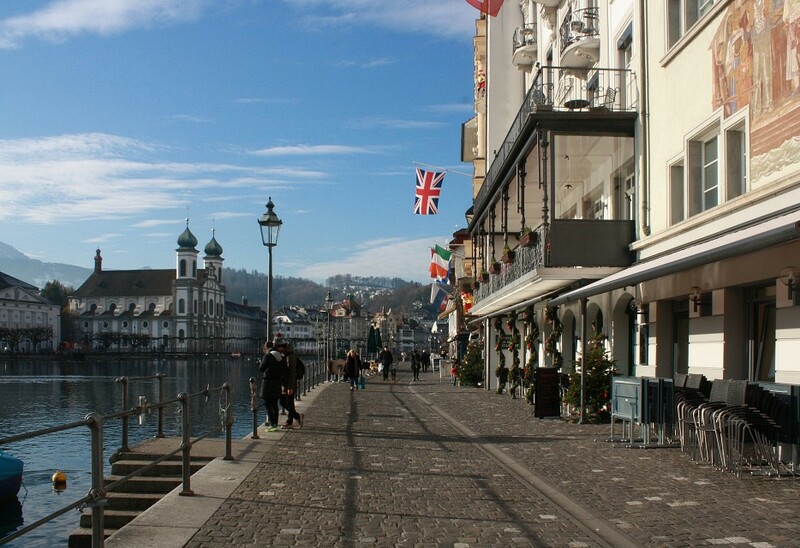 There is also information about the history of Luzern located all along the bridge, making it a great place for a stroll by the water. The Lion Monument, also known as the “Lion of Lucerne”, is a sculpture located just outside the city center. 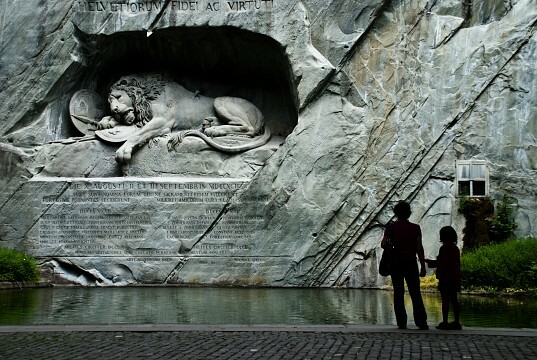 The Lion of Lucerne commemorates the Swiss soldiers who died when they stormed the Tuileries Palace during the French revolution. The lion lies fatally wounded, impaled on a spear, and has been carved into the side of the rock. Beneath the sculpture there is a Latin inscription, translated as ‘to the loyalty and bravery of the Swiss’. The lion lays in the rock above a small body of water, and measures ten meters in length, and six meters in height. Find the monument on Denkmalstrasse. Take tram number 1, 19, 22 or 23 towards Luzern, Löwenplatz. The statue is a short walk from here. The Glacier Garden, located behind the Lion of Lucerne monument, features an expansive garden, a museum and a mirror maze. The garden features expansive green spaces, and long paths dotted with old fashioned huts. A great place for children to run around outside it is part of a huge natural playground, and there is also a restaurant suitable for a light lunch. The museum features exhibitions detailing the Ice Age, and what used to exist where Luzern now stands including ancient fossils, and replications of Ice Age animals. The mirror maze stretches through the inside of the museum, with 90 mirrored panels which have been a main attraction since they were installed in 1899. For those who have a passion for art, don’t miss the Rosengart Collection – a group of paintings by artists such as Pablo Picasso and Paul Kee as well as pieces by other modernist artists. The collection belongs to father and daughter pair, Siegfried and Angela Rosengart, and has only very recently been made open to the general public. The collection is extensive, with 32 paintings by Pablo Picasso, alongside many of his watercolors, and over 300 items in the entire exhibition. The museum is open from 10AM – 6PM, everyday including public holidays during the months of April-October, and 11AM -5PM, everyday (except for Carnival) during the months of November – March. Entrance is 18 CHF for an adult, and there are reduced rates for seniors, students and children. The museum is located on Pilatusstrasse 10 – and is just a three-minute walk from the central train station - or alternatively take the bus to Kantonalbank. The William Tell Express, is a train and boat ride, originating in Lucerne that will give you incredible views of central Switzerland as you wind your way down to the southern part of the country, where your journey ends in the Italian-speaking city of Ticino. By using both train and boat, you will be able to see the best of Central Switzerland and Ticino, arguably the two most beautiful regions in Switzerland. The trip begins with a three-hour tour of Lake Luzern – this can also be booked separately if you do not want to travel to Locarno, or Lugano – before you board a 1st class carriage of a train that takes you across the Swiss mountains and through the infamous Gotthard tunnel. The entire journey takes around five hours, with a meal and refreshments on the boat journey, and the opportunity to buy snacks and drinks on the train in the dining carriage. Reservation is compulsory and should be made within two months of travelling – note that the journey is first class only, so first class tickets for both sections on the trip with have to be bought. In the summer, a member of staff on board the train will point out specific bits of history and certain sights that you may otherwise miss (this service is usually in English, German and French). The biggest highlight of the trip, are the seats of the train carriage, which are able to swivel 360 degrees, and the huge panoramic windows, allowing you to get the best views of the scenery. Book the trip online at sbb.ch, or at any ticket office in a train station across Switzerland. When is Lucerne, be sure to check out Max Chocolatier, a chocolate maker with its boutique store located in the Old Town. Serving chocolate in slabs in a variety of flavors, with or without nuts, the stores is every chocolate lovers dream. The chocolatier also makes truffles and sells a variety of chocolate in perfect gift-wrapped boxes. It is not cheap, but you are paying for exceptional quality chocolate made from the finest ingredients. For a slightly different take on Swiss cuisine, head to STERN, a small cozy restaurant situated in a listed building, on the outskirts of the Old Town. The restaurant is open for breakfast, lunch and dinner, though the kitchen closes for a short time in the late afternoon. They have an outdoor patio as well as plenty of indoor seating, so it is a great place to come whether its summer or winter. A meal with drinks, wine, and a starter or dessert alongside the main course should be no more than 100 CHF per person. The attached hotel offers clean, modern rooms in a great location for a fraction of the price of similarly rated hotels. A single room costs from 90 CHF a night, a room with four beds is 190 CHF a night – all rooms include a breakfast buffet at the restaurant downstairs. Find them at Burgerstrasse 35. One of the few restaurants across Switzerland that has managed to serve well-priced, tasty Indian food is GourmIndia. With meals ranging from 10 CHF to 40 CHF, the food is served in big portions, alongside a great selection of red wine. All the chefs are from India, and specialize in more traditional ‘village’ dishes, such as Goan prawn curry, or Tandoori chicken cooked in a clay oven. For a true taste of all that the restaurant has to offer, book the King’s Menu online at gourmindialuzern.com/, and get the full menu for 45 CHF per person. The menu includes a starter platter with mixed entrées, four different main courses served in taster portions, as well as naan bread, and basmati rice. A dessert and Indian tea is also included in this great value meal. Located on Baselstrasse 31, be sure to make reservations if you want to visit on a Friday or Saturday night as it fills up quick! 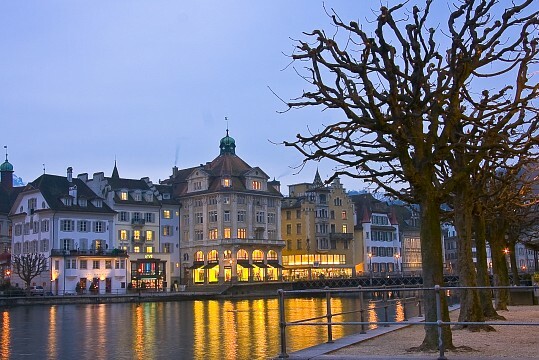 The Hotel Schweizerhof, set on Luzern lake is one of the most beautiful hotels in Lucerne. The hotel features a number of restaurants, both serving Swiss cuisine. It also features a prestigious bar, with regular events such as tapas evenings and incredible signature cocktails. The fitness area and spa are extensive, and offer something for everyone, even little kids. With packages such a mini manicures, and facials for teenagers, kids are more than welcome in the spa area. While there is no pool, the various saunas offer views of the Alps, as well as different temperatures and scents. 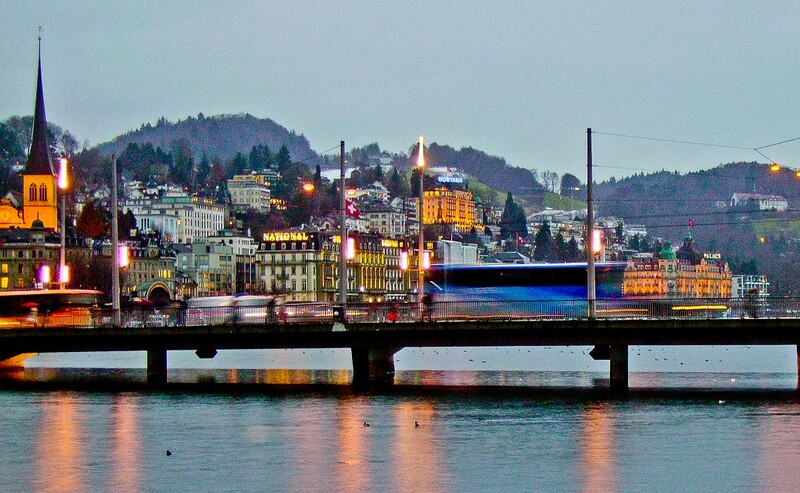 The Lion Lodge Luzern is one of the cheapest places to stay in Luzern, with dorm rooms from just 35 CHF a night. Located close to the city, and next to the Lion Monument, the hostel offers kitchen facilities, free WiFi, as well as free parking spaces – useful if you are driving around Europe! The hostel is basic, but provides all you need for a comfortable night sleep close to the city center. Like most of Switzerland, Lucerne is an extremely safe city, with very little serious crime. Pick-pocketing does still occur, especially around tourist attractions so caution should be taken. At night, women should also be aware that walking alone may be a little uncomfortable, especially around the train station, but as long as you are walking on well-lit streets there is little reason to be concerned. The closest airport is Zurich Airport, with direct trains running to Lucerne every hour, and trains running more frequently from Zurich main station. The journey takes around 90 minutes, and tickets must be bought before boarding the train. There are also trains from Zug, and Bern, as well as connecting trains from most other cities in Switzerland. The train system is by far the most efficient way to travel around Switzerland. For more information and timetables go to sbb.ch.